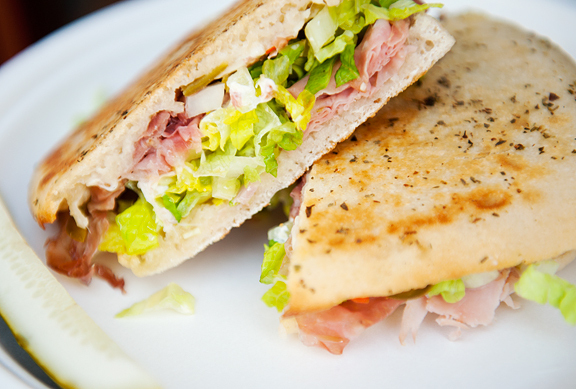 We’re back on Pearl Street for this week’s sandwich – a panini caldi (hot sandwich) from Frasca’s Caffè. Caffè is an unassuming little space wedged between Pizzeria Locale (also part of Frasca’s dominion) and The Pinyon just east of the Pearl Street pedestrian mall. It’s easy to miss as you walk past, but I’m here to tell you it would be a mistake to miss it. 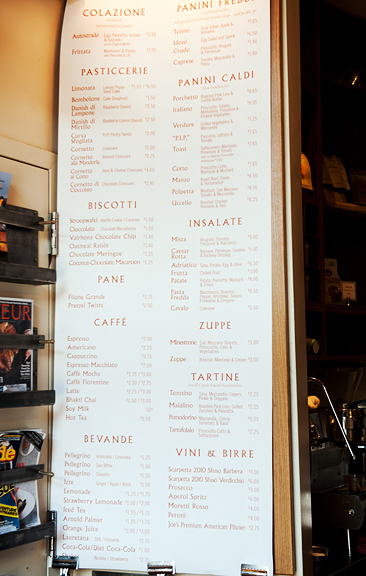 Caffè serves up Italian pastries, breakfasts, cookies, caffeine, beverages, soups, and of course, sandwiches. I went straight for the hot paninis, trying a few different offerings. It was a tough call picking just one sandwich to showcase because they’re all pretty amazing. Jeremy and I narrowed it down to three favorites: the Polpetta (meatball – Jeremy’s favorite), the Manzo (roast beef – just incredible), and the Italiano (prosciutto and salami). Ultimately, I had to make the hard decision. To the sandwich: For $8.95 you get a hot-pressed sandwich layered with savory prosciutto, salami, mortadella, melted provolone, crispy shredded lettuce, and tangy, crunchy pickled vegetables. Your sandwich comes with a bag of potato chips and for $.30 more, you can add a pickle spear to that. The Italiano panini combines all of the things I love about sandwiches: hot melty stuff, flavorful meat, crisp and cold vegetables, tang, spice, creaminess, crunch. Did I mention the bread? I can’t get that bread out of my head. I don’t know if it is focaccia or some other bread that I have woefully little knowledge of (maybe one of you fellow Caffè patrons can enlighten me? ), but it is flat, soft in the middle, hard and crunchy on the outside, and it doesn’t sog up like normal bread. In fact, I’ve had their sandwiches to go and eaten them an hour later to find the panini’s best characteristics well-preserved. Pro tip: There is enough space for a dozen patrons to squeeze in and dine, but it can be busy during lunch. I prefer to call ahead for take-out orders. Grab a pastry and some caffè while you’re there to pick up your sandwich. 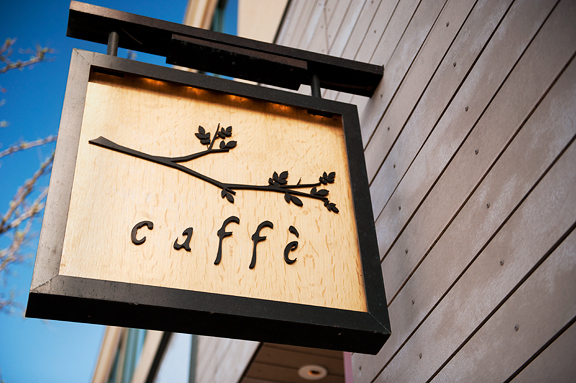 Where: Frasca Caffè at 1720 Pearl Street, Boulder, Colorado 80302. When: Have yourself the Italiano panini caldi or anything else from the menu Monday through Friday from 9:00 am to 5:30 pm or Saturday and Sunday from 9:30 am to 4:00 pm. Contact: Call Frasca Caffè at 303.442.9464. Visit their Facebook page. Full Disclosure: My opinions. No comps for the chomps. Already on my list to visit soon. Thanks! Love having you as the resident Sandwich Sleuth so we can all reap the rewards of your endeavors; thank you. Always love all your photos but I’m sure Robin must be thrilled with the elegant light in which you’ve captured her confections. And your pup….does she ever take a bad photo? Disney will soon be calling. (Sorry; comments on several posts here). Happy Easter Jen. I has no idea this little gem was hidden there, you got me with that bread description! Good bread is the foundation for a great sandwich! Keep the reviews coming, I am loving them! I may have to plan a trip just to try that sandwich! Follow the food…. Kirsten – hope you enjoy! Toni – Thanks! Hope you and the family had a lovely holiday. Rocky Mountain Woman – you could camp out on the street and dine all day, lots of great choices. I live in the Bermuda Triangle for sandwich lovers, between Dish, Il Caffe, and Snarfs. Each has it’s rhyme and reason for loving it and your description of the “Italiano” has my mind made up for today! I may end up lost forever. Hey Jenny! The bread is a light sourdough recipe made with “00” caputo flour, the same flour used for the pizza dough at pizzeria locale (and Il Caffe also happens to retail kilo bags of the flour.) After letting it rise for a number of hours, it takes a brushing of garlic olive oil and a sprinkle of oregano and parmesan and is baked to crispy softness. yum.